Pennsylvania Dutch-style cheesecake uses a slightly tangy type of cheese with larger curds and less water content, called pot or farmer’s cheese. Philadelphia-style cheesecake is lighter in texture, yet richer in flavor than New York style cheesecake. Farmer’s cheese cheesecake is the contemporary implementation for the traditional use of baking to preserve fresh cheese and is often baked in a cake form along with fresh fruit like a tart. Lactose free cheesecake may be made either with lactose-free cream cheese or as an imitation using Vegan recipes combining non-dairy cream cheese alternatives with other lactose-free ingredients. 1739 Caspar Wistar founded the first successful large scale glass factory in the U.S. in Allowaystown, New Jersey. 1838 It supposedly rained frogs in London. 1849 Jacob Perkins died. Perkins was issued the first U.S. patent for a refrigerating machine. It used sulfuric ether compression. I want cheesecake so badly !!! 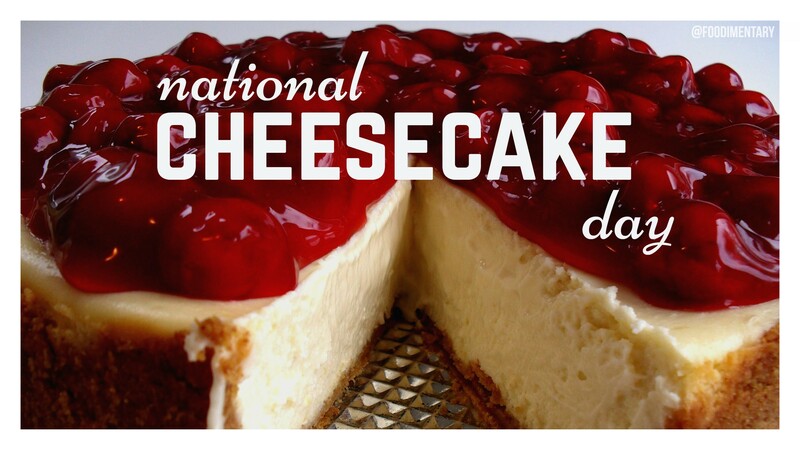 Cheesecake is literally my favorite dessert. So happy that it’s todays national day. Cheese cakes are delicious, its a good balance of tart and sweet.